1 Short cut to first boss - Go to the options mode and select Nightmare difficulty. Play the game and get into the first level warehouse. Proceed to the right, past the first thug and then past the German Shepherd. Next, jump on the first crate and crawl to the right. You will go through the crate and to the right will be the forklift boss. 2 Full Web Power Up Before Kingpin - Before you meet Kingpin, investigate the maze and you will find a full web power up in the maze. You will need this to stop Mary Jane from falling in to the pit. 1 Invincibility / More Go to the Options screen and higlight "Level." Next, press and hold START on Controller Two, then press and hold A, B, and C on Controller One. While holding these buttons, press UP, then UP and RIGHT on Controller One. If you've done this right, the difficulty level should read "!!!." 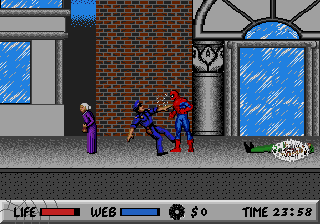 During the game, you can pause and press A to refill your web-shooter, B to refill your life, C for five seconds of invincibility, and all three buttons to skip to the next level. personally created by Stan Marvel for Marvel Comics. 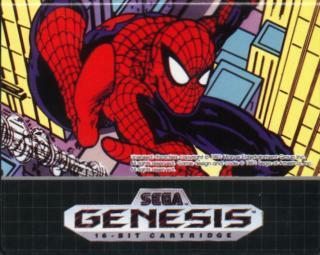 I think (to the best of my knowledge anyway) this was the only Mega Drive game released on a coloured cartridge - It's bright red! 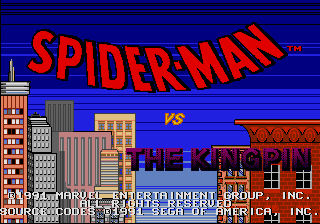 Spiderman VS Kingpin is my fave of the bunch. In the game you have a certain amount of time to beat the game. And it can be kind of frustrating when you get to the final stage and then your time runs out halfway through it. Another unique feature in this game is that you can take pictures of yourself in action and sell the pics for cash to use for your web-slinging materials and stuff. 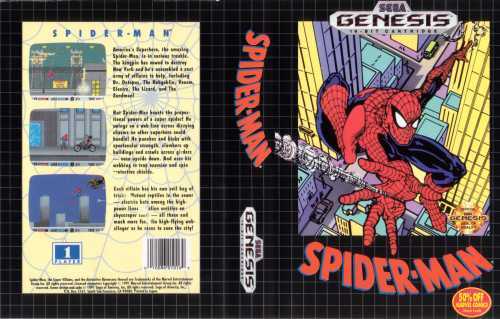 This is one of those games in which I got to the final boss but never quite managed to beat... (in comes Genecyst with save-states). yeah, i own the game. Its kinda hard in some places but thats what extra live codes are for!!! Where do I put the code for example :ADNB-4AD8 for Infinite lives? With the Movie coming soon to theaters! You gotta try this game! It has all the ablityes of spider man! Webcrawl, websling.. ect! Its great! and its a blast to play for hours on end!